A serious contender for the family SUV market! 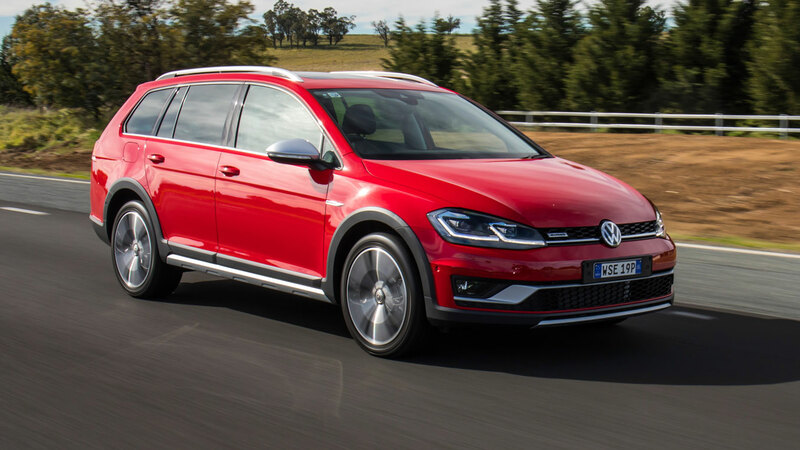 With SUVs well and truly winning the popularity race as the new family cars of choice in Australia, at BabyDrive we wanted to put the Volkswagen Golf Alltrack wagon through its paces and see if we have been converted to being SUV lovers or if there is still a place in our hearts for the old-school wagons!! The double stroller fitted with six shopping bags, our Mountain Buggy Urban Jungle stroller and seven shopping bags or our Steelecraft Holiday2 umbrella stroller and 10 shopping bags! 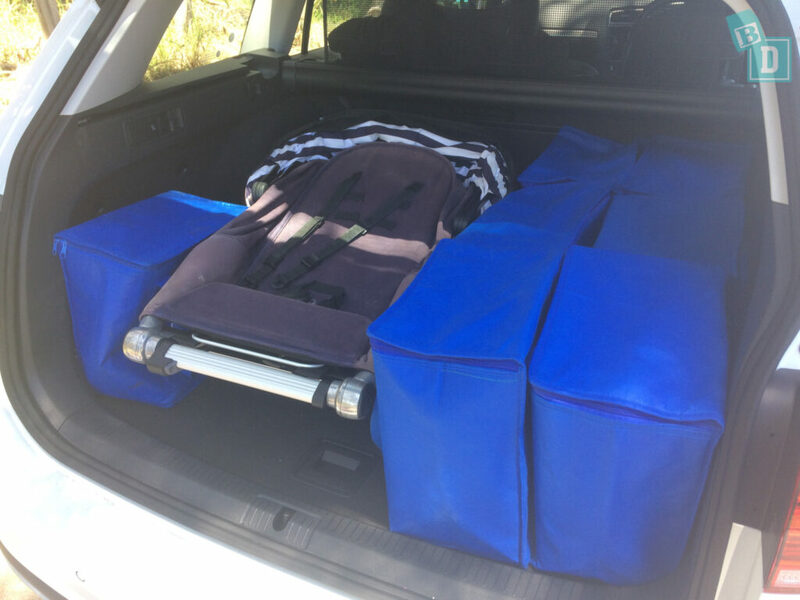 I loved the side wells in the boot too and found them particularly useful for storing wet gear! I have not had to think when driving the Golf Alltrack, it is a very easy car to just jump in and drive, as well as being stable in bends and a lot of fun! It has everything I require for a BabyDrive; excellent visibility, good space and storage capacity. The air conditioning and media system are very easy to use and I can wear a ponytail whilst driving the Golf! The rear seat space I have found very good for installing child seats. There are two ISOFix in the rear outer seats and top tethers in all three rear seats. I was able to easily install two rear-facing child seats with plenty of room still for the 184cm front passengers. The Mountain Buggy Protect infant capsule and the Infasecure Kompressor4 both rear facing, in the outer seats. The headrests are a great shape for attaching a child’s rearview mirror to. My daughter has been very happy travelling in this car. My only major concern driving the Golf Wagon is there is an initial delay when you accelerate from a standstill, the car is soooo slow to take off making it really frustrating! I could compensate for it most of the time but when I forgot and pulled out at a roundabout or junction expecting an instant response it just wasn’t there and I was so scared of being hit from the side on a few occasions. 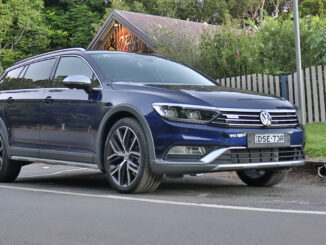 This delay really ruined the almost perfect Golf Alltrack Wagon for me! I love driving and I am not sure this is something I would want to live with. I also felt the model we drove did not feel as special as I was hoping it would. I always thought driving a Golf the vehicle would feel a little more flash and sporty, but this Golf feels very basic, practical and functional! This may be because the car we drove was the most basic spec of the Alltrack models, the exterior was ‘appliance white' and the interior had cloth seats, making it feel built to a price! These were the only few things I could fault the Golf Alltrack Wagon on and in terms of the vehicle's shape and ride it is just as good and better than many SUVs I have tested for BabyDrive! 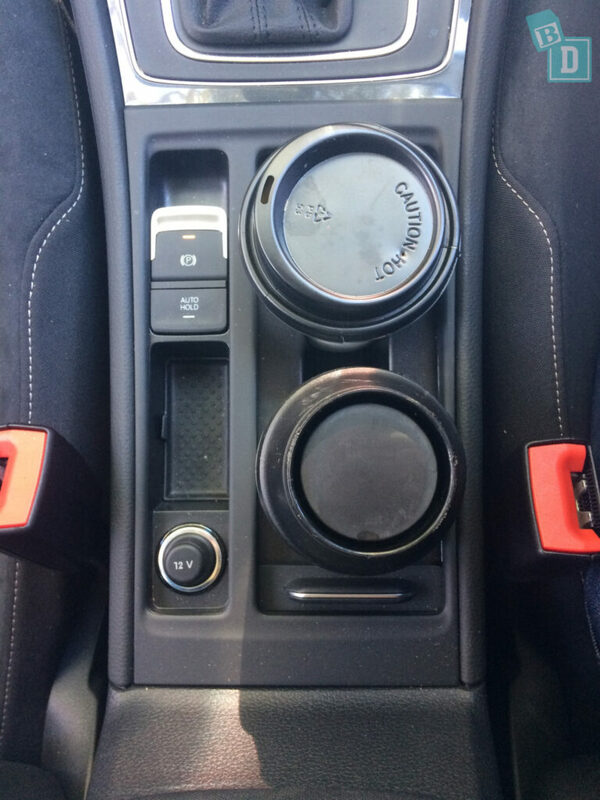 There are two cup holders in the central console of the golf that both have retractable grippers inside them which means they will hold most size vessels without letting them move. Hurrah!!! I could put a 600ml drinks bottle and a medium takeaway coffee cup in the cup holders, they were also a great size to hold a Pigeon baby bottle as well. The door pockets in the front of the golf are enormous! I could get both my large refillable water bottle and 600ml water bottle in them at the same time as my iPad and wallet. They are also felt lined so nothing makes a noise or rattles so nothing to disturb your sleeping baby. Hooray!!! The door handles are not storage wells in this vehicle. However, the size of the door pockets more than make up for this. In front of the gear lever is a large storage area with a rubber grip base to stop things moving around and it has a roll-over cover to hide anything in there. There is a USB and AUX point in here I found this the best place to charge and store my phone whilst driving. The central console has a small square storage box which does have a rubber base but the sides are hard plastic so things in there may rattle against the edges there are no sockets in here. The lid of the central console doubles as the armrest for the driver and front passenger and it has a strange extending and lifting mechanism as it goes between the two functions that I found hard to manoeuvre into a comfortable position! As a lid, it does not close with a catch and just rests down on top of the box. There is a very large glasses case in the ceiling of the car where the light switches are situated. 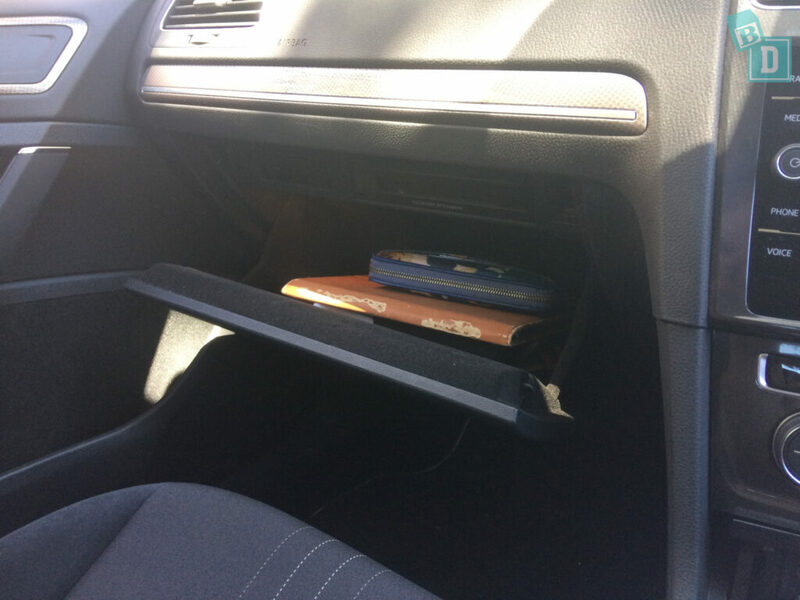 The glove box is also felt lined, it is large enough for the manual and iPad, my wallet and keys but that is all. 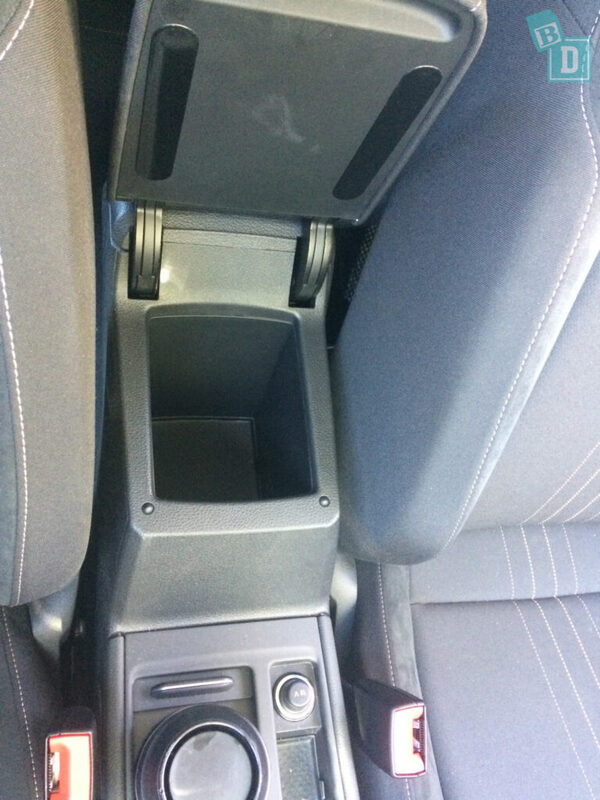 There is under seat storage under both front seats, which is not lined, with a maximum storage weight of 1.5 kg. I could fit my wallet in there but not an iPad. There is no under seat storage in the back. In the back, the door pockets are felt lined and deep. I could fit either a baby bottle or Sippy cup, 600ml water bottle or my larger re-fillable drinks bottle. My wallet would only just fit in there with one of those but I could not fit an iPad. There are one-third map pockets in the back of both seats they are just deep enough to hold an iPad however you would be able to see the iPad was there. There are two cup holders in the back in a fold-down armrest in the central seat back. The cup holders are adjustable and have movable edges so it will hold vessels of different sizes. I could get my large refillable water bottle in there as well as a Pigeon baby bottle. Folding down the armrest in the central backrest also exposes a handle that when you pull it brings that section of the backrest forwards and you can access the boot through here. 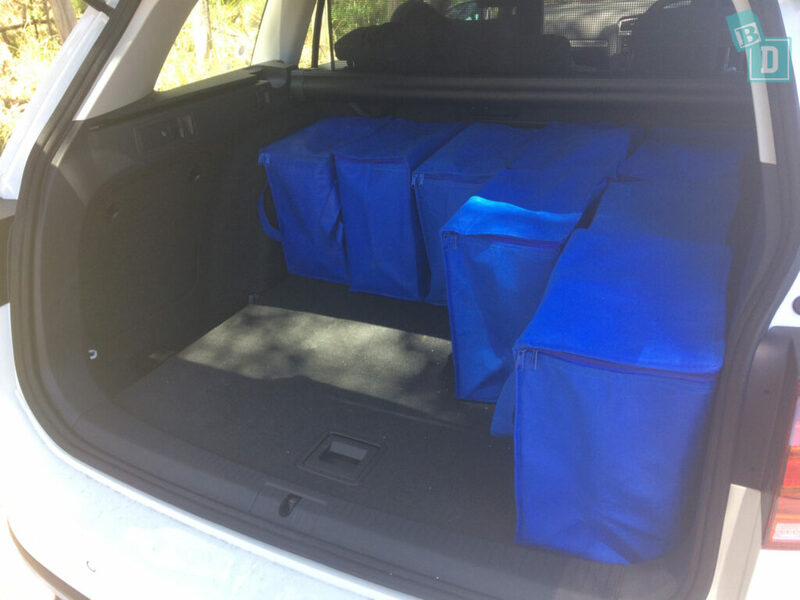 The boot space of the Golf Alltrak Wagon is enormous. 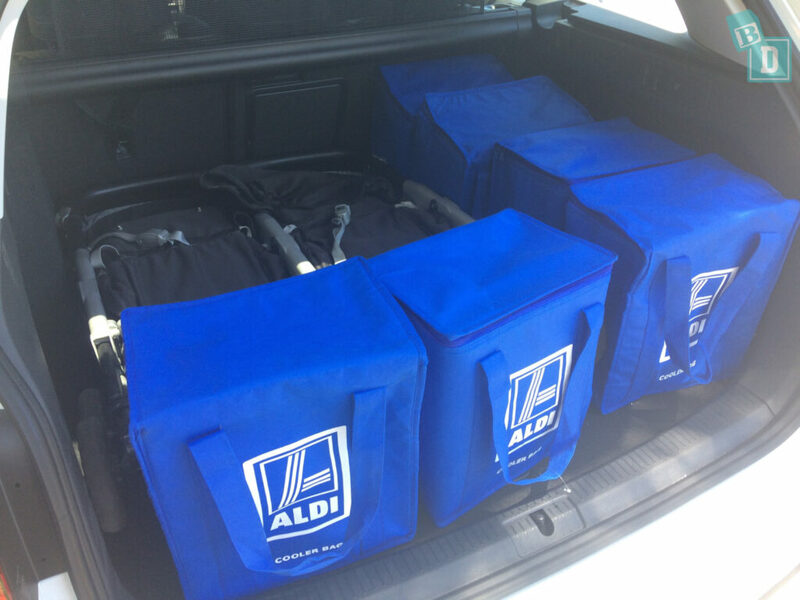 You can get 15 shopping bags in the boot, five across and three deep. 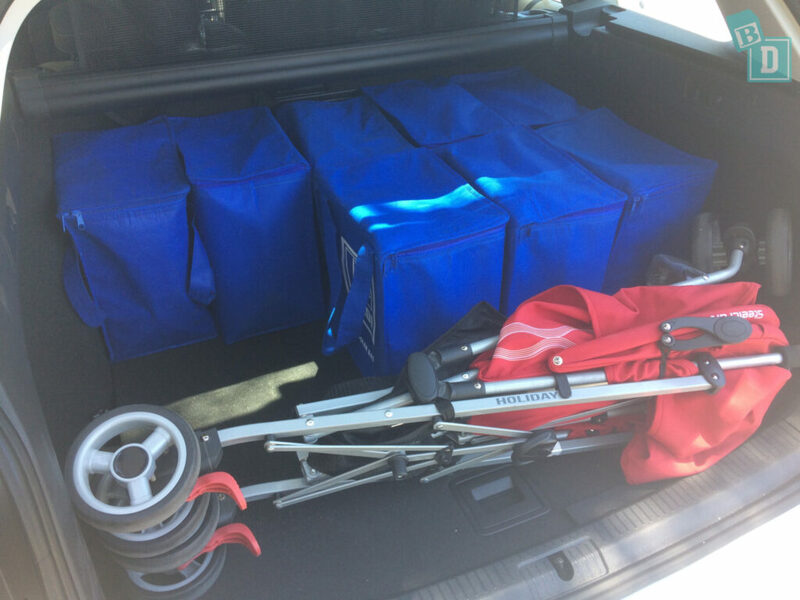 With the small stroller in the boot, you can get 10 shopping bags to date and five across. With the Mountain Buggy Urban Jungle stroller in the boot, I can get seven shopping bags in, six to the right-hand side and one on the left-hand side. With the twin stroller in the boot I can get six shopping bags in too. Four down the right-hand side and two in front of the stroller. There is plenty of room on top of the stroller also for bags and equipment. 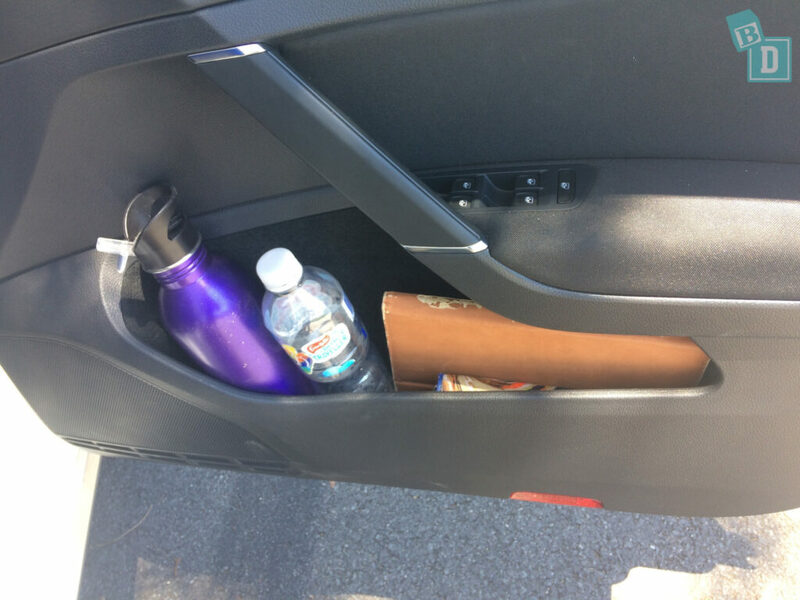 There are also two wells, one on either side of the boot behind the wheel arches where there is plenty of space to hold items you do not want to move around; sun cream, water bottles etc. On its own in the boot you could carry a large dog or there is plenty of room in the boot for the Mountain Buggy Urban Jungle and a medium size dog. There is also some storage areas underneath the floor of the boot, however, the dog blind and parcel shelf both store away under here too. There is a retractable roller blind and retractable dog blind for the boot. Both store away easily underneath the boot floor. 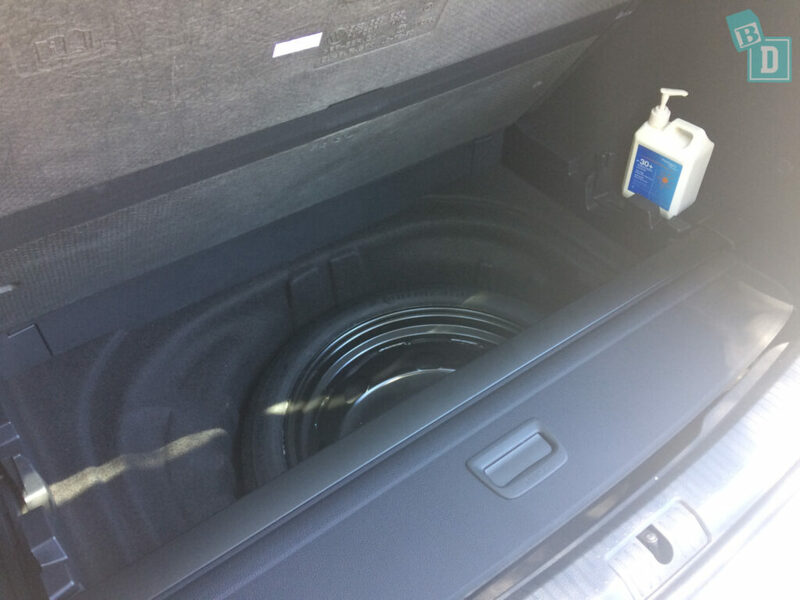 The cavity underneath the boot floor holds the spare wheel also but there is plenty of room in there to keep other equipment too. 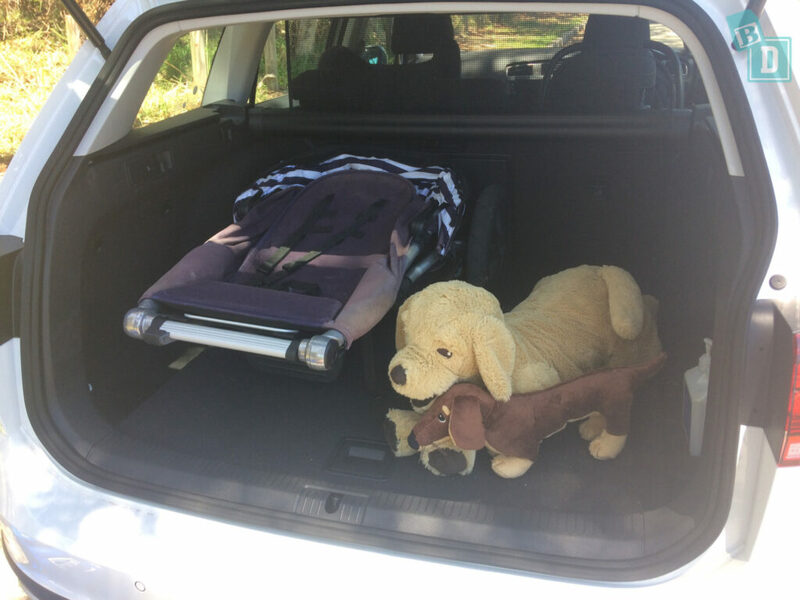 The boot space of the Golf Alltrack is very functional, usable shaped space making loading shopping bags easy and you can slide strollers and prams in and out without any trouble. There are also two wells, one at either side behind the wheel-arches that are very useful for separating items and storage. There is a 12V socket on the right-hand side of the boot and light in the ceiling that comes on automatically. There are hooks, one on either side of the boot to hold shopping bags in place and stop them sliding about the boot. Also, two fold out hooks one on either side. Alongside these there are leavers one on either side to fold forward the second-row seats to make even more storage when you are not using the second row of seating. There is plenty of room in the boot floor for a nappy change; the floor is even and softly lined. You do have to bend down more than you would in an SUV for example, but it's a reasonable height and practical space. 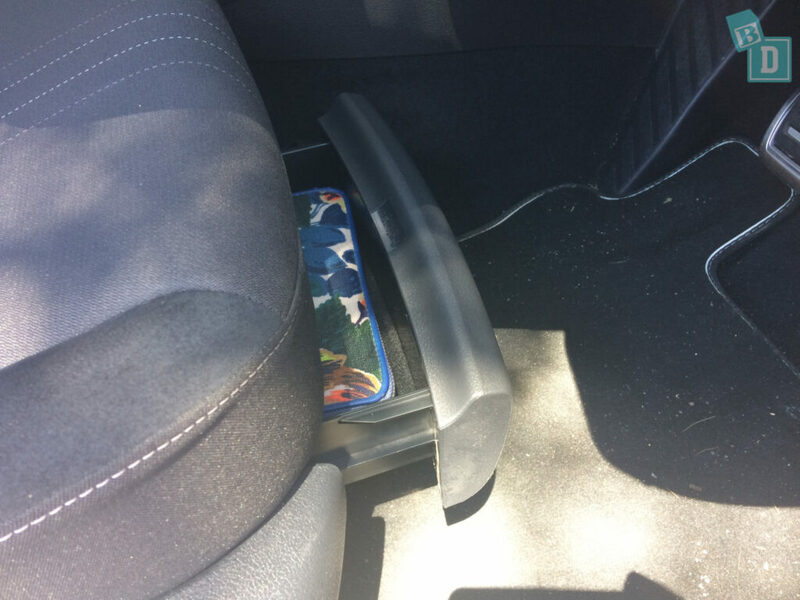 The parcel shelf is a retractable blind that it has an easy to use a function that you tap the handle to get it to retract halfway and then tap it again for it to fully retract. I like this detail because when you have your hands full of bags or babies just being able to tap the blinds handle is much easier than wrestling with a flimsy roller blind. I have found the parking sensors to be quite lively in the Golf while I’ve had it and although there is a button next to the gear lever to turn the parking sensor off, that also turns off the entire camera as well as the sensors. You cannot just mute the sound of the sensors. There was no Lane Departure Warning on the model I drove. The indicator volume is not adjustable however it is not loud or interfering. The media system does not have a satnav of its own; you have to use it through Apple CarPlay or Android Auto, which I prefer anyway. 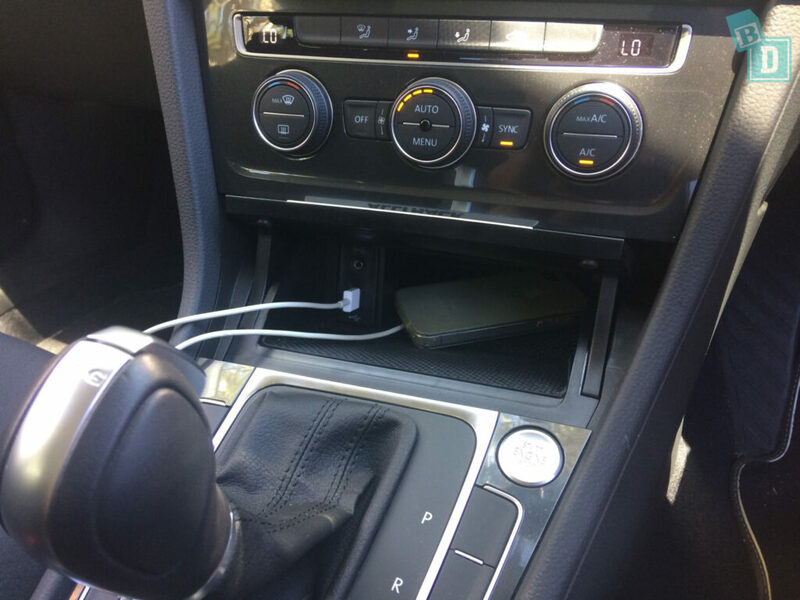 It was easy to connect my phone to the Golf and when playing nursery rhymes on it, they came out of the car speaker straightaway when I plugged it in. The windows and door noises are not too disturbing you can definitely hear the mechanism of the windows but it’s quite a gentle sound. The car's doors opened and closed with a nice soft sound and smooth motion. The driver can lock the windows from their door controls as well as locking all the car doors from switches situated near their door handle. There is no automatic lock you have to do it manually. There is automatic engine cut out when you stop at lights. You can turn this off with a button next to the gear lever, which you have to turn off on every trip if you find the stopping and starting of the engine disturbs your baby. Engine and road noise has not been a problem in this vehicle, The Golf Alltrak Wagon has been quiet and quite apart from the delay when taking off at junctions. There is a seatbelt removal alarm if you remove your seatbelt or try to drive without a seatbelt on there is a light flashing on the dashboard as well as a loud noise to alert you to the fact seatbelt is not on. You can get out of the car leaving the engine and air-conditioning running without sounding any alarms. Which is fantastic for when bub falls asleep. 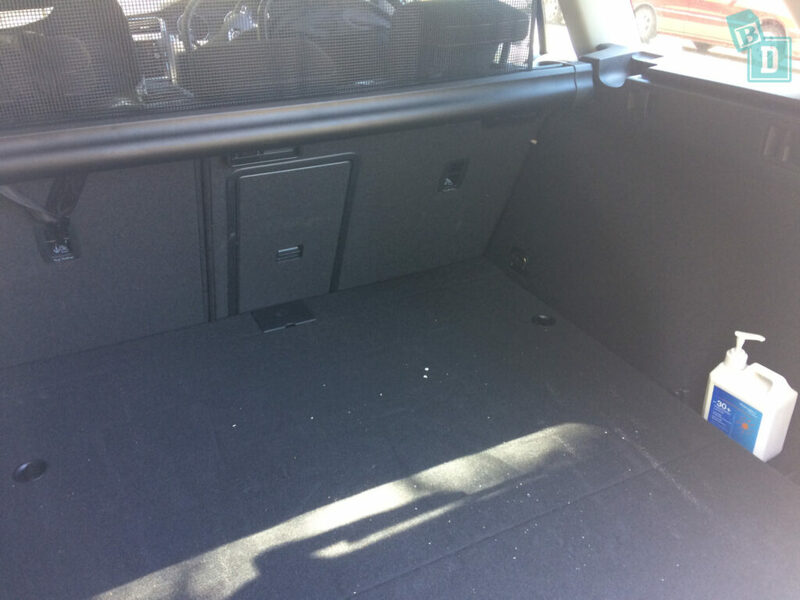 This five-seater Golf Alltrak Wagon has two IsoFix connections, one in each of the outside rear seats. As well as three top tether points one in the back of each of the rear seat backs. I could only fit two child seats at one time across the rear row one in either outer seat I could not fit a third in the central seat. 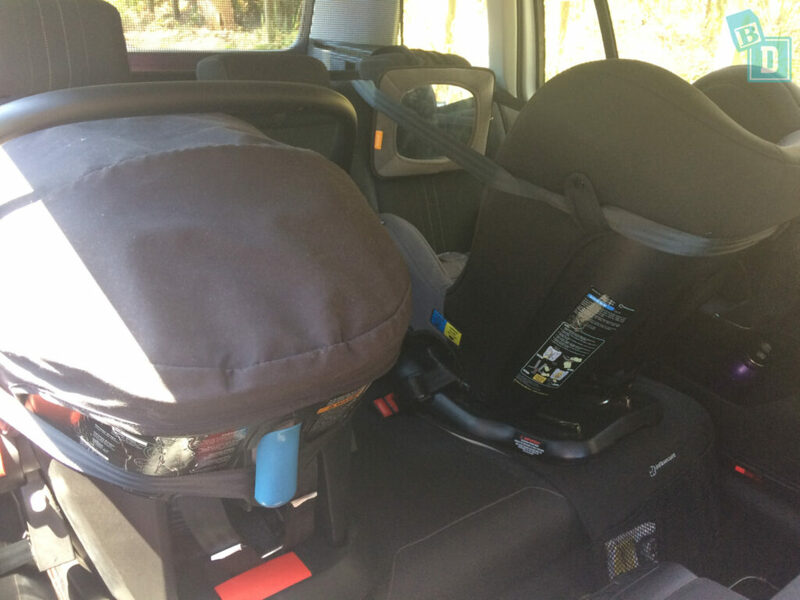 I installed the Mountain Buggy Protect infant capsule and Infasecure Kompressor4 both rear facing using ISOFix. 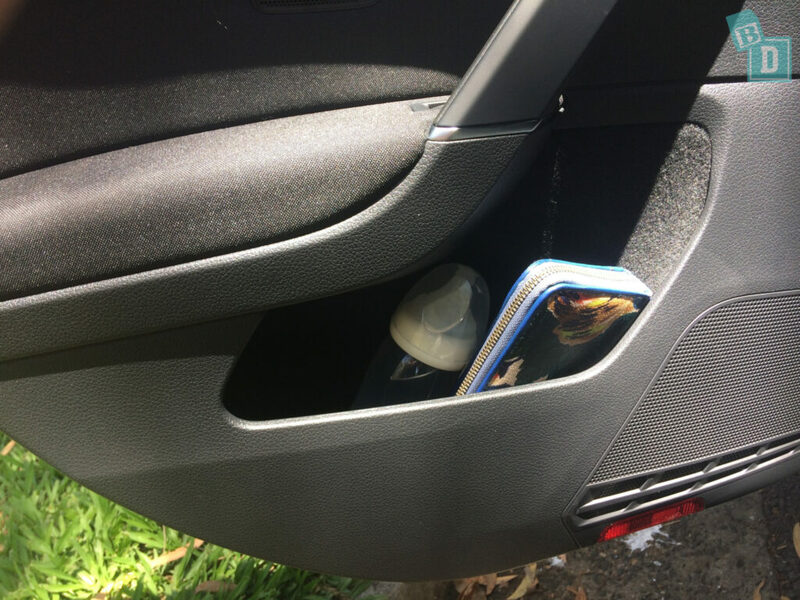 The seats were relatively easy to fit, the ISOFix points are exposed and easy to locate and I found it easiest to connect the top tether by bringing the seat backs forward rather than reaching across the long boot. Putting Tulsi into her child seat car from both inside and outside of the car was fine and the door openings allow plenty of space for this. 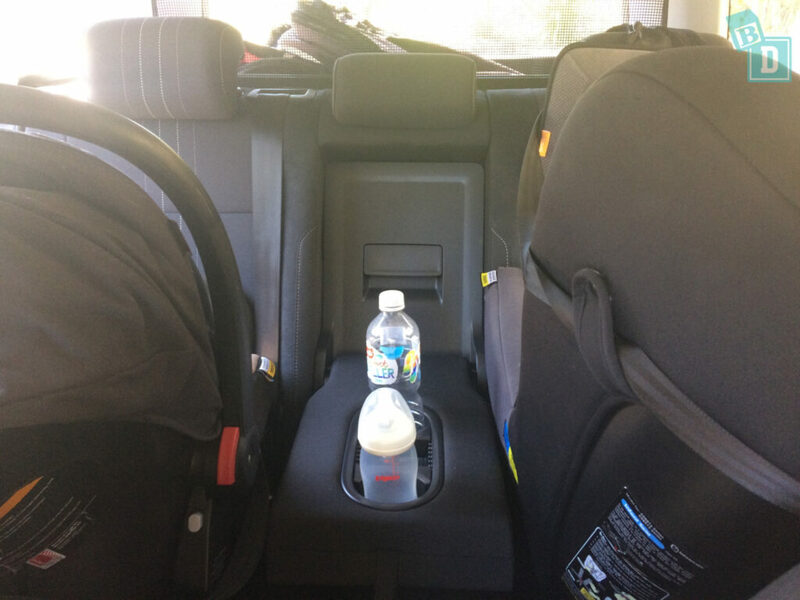 With one child seat installed there is plenty of space to feed Bub in the outer seat of the back row. The seats in this model are mock suede I have been petrified of Tulsi dropping food or spilling anything on them whilst having the car because it would be particularly difficult to get things stains out of! 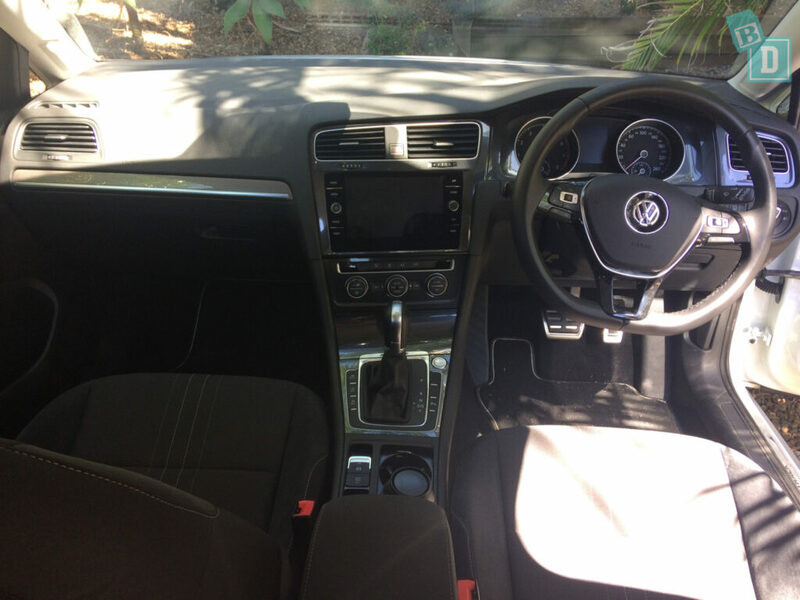 The front seats in the Golf Alltrack Wagon I drove were relatively comfortable they were firm but nicely shaped to your body. In the back, the seats again are comfortable and firm. For a mum travelling in the back the outer seat was more comfortable, in the centre you have a raised foot well to straddle and you are pressed up against the child seat beside you. I am only 162cm and I found the legroom quite restricted sitting in the central seat. For the first year of Tulsi's life when we would go out as a family, if I wasn’t driving, I would travel in the back with Tulsi so it’s important to check the back seat comfort as you may be spending a lot of time in them! They were never something I gave any thought to before but I definitely notice a good or bad back seat now! The headrests do allow you to wear a ponytail! Although the headrests do not adjust forward and backwards the angle they are at allows for a ponytail. The steering wheel is fully adjustable both in/out and up/down. I found the cruise control buttons tricky to get used to in the Golf. To change the speed it had increments of tens or singles using different buttons that are not very well labelled so I found using the cruise control quite difficult to begin with. Once I became familiar with the controls it was easier to use but I still had to think which controls to use each time and not the obvious ones. The accuracy of the cruise control was tricky too; I found it wasn't reliable on undulating roads at any speed which I was really surprised at?! The air conditioning in the Golf was very good. There are four vents in the front; two in the centre and one at either end of the dashboard. There are also two vents in the back of the central console box for the rear passengers. I found the air conditioning cooled the car very quickly on max a/c and the dial controls made it easy to use whilst driving, I really struggle whilst driving if I have to use the touchscreen to change temperature or fan speed for the air-conditioning. There are no window blinds in the back of the Golf but the windows are tinted and I have not had a problem with the sun coming in on my child's face. The back window is flat however being a wagon but it is a long distance from any rear-facing child in their child seat. Visibility is really good in the Golf Alltrack Wagon! I thought being a long car visibility would be really poor but actually, it's been very easy to park, manoeuvre and drive even with both child seats installed, a mirror and the dog blind up. Visibility is also good for rear passengers as the windows are deep and the boot has large windows on either side as well, making the interior light and bright. Both visors in the front have vanity mirrors that are lit. The interior lights in the front are two individual LED lights with controls in the ceiling. Along with these are the controls for the backlights, which is fantastic! I can control the rear passengers’ interior lights from the front, so if I’m driving in the dark I can easily pop a light on in the back for the baby, so they’re not scared, until they fall asleep and then turn it off once they are asleep! Yay!! No more reaching through to the back ceiling whilst driving!! There are also ceiling switches in the back too for older passengers! I found the Golf Alltrack Wagon really enjoyable to drive and I haven't had to think about anything apart from the cruise control! It's a really easy car to just jump in and go. Apart from the delay when you accelerate from a standstill so at the roundabout or a junction you pull off and there is a very distinct one or two-second delay before the car moves even though you’re accelerating! This morning at a roundabout, on a steep hill this happened and it was actually quite dangerous. The car just felt like it would stall and had selected the wrong gear. 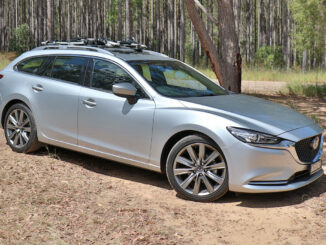 On open country roads, this car is fantastic and grips the road well in bends! You can trust it driving around with your family in and still have fun with it when you are driving on your own! I found parking the Golf is easy and visibility is very good. The reversing camera is very clear and complements the good visibility of the rest of the car. Even with the length of the vehicle, I find the sensors weren't needed because the visibility is so good. There are handles and coat hooks in the ceiling in the back above both doors, these handles are well positioned for attaching a child’s toy to. There are extra coat hooks on the side pillars of the car too. The doors have a fabric panelling on them and it is in the area of the controls that you rest your arm on too. I think this would become dirty over time and not be as wipe cleanable as a plastic or rubber surface would. There are floor mats throughout the vehicle that have a reflective trim, this is a nice feature that I am seeing on a lot of new cars, it would help especially at night. This model does not have keyless entry to the main part of the car, however, I could open the boot if the key was in my pocket but it does not have a powered tailgate. One thing I have noticed since being a mum is I hate it when I reach a destination or get home from being out and Tulsi has either done really well in the car or she is screaming her head off and I have done really well to keep it together for the entire journey (usually the latter!!) and it takes 10 minutes to park the car! It can be really stressful. Usually I dread when we get the big cars and wagons as they take longer in our tight apartment block carpark, but the Golf Alltrak was really easy and enjoyable to drive and to park! The VW Golf Alltrack Wagon comes with seven airbags as standard. Dual frontal and chest airbags for both front passengers, curtain airbags for front and rear passengers in the event of a side collision and a knee airbag for the driver. The VW Golf Alltrack Wagon has a five-star ANCAP safety rating, scoring 35.92 out of 37. It scored an almost-perfect 15.92 out of 16 for the frontal offset test, 16 out of 16 in the side impact test, two out of two in the pole test and with whiplash protection deemed ‘good’. Pedestrian protection was ‘acceptable’. Blind spot monitoring, lights flash in your side mirrors if something is detected. I do love this safety feature as sometimes, especially with child seats installed behind you it is harder to see if there is anything beside you or in your blind spot when you change lanes. I like having the peace of mind when changing lanes on a motorway too. 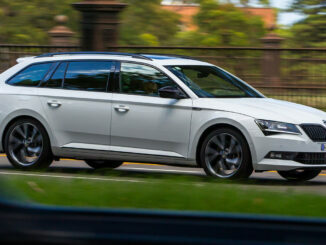 The Golf Alltrack Wagon has Adaptive Cruise Control which has a manual speed limiter. Enabling you to set the maximum speed the vehicle will go! I think is a fantastic feature for avoiding speed cameras or accidental speeding when you get distracted, which is easily done with children on board! 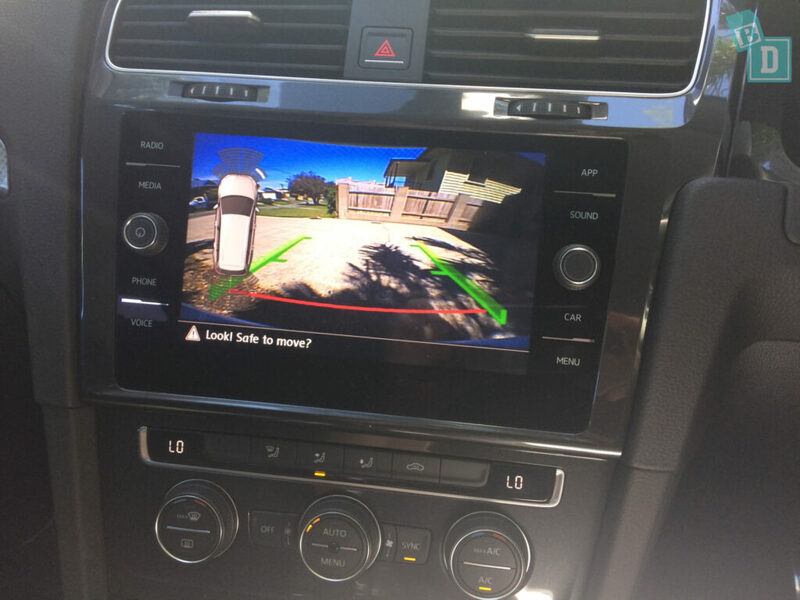 The Golf Alltrack also comes with high and low-speed autonomous emergency brakin, including Manoeuvre Braking, which is automatic braking when manoeuvring to park designed to stop you hitting obstacles you can't see. There is also electronic stability control, electronic brake-force distribution and anti-lock brakes, as well as front assist, park assist and extended electronic differential lock. 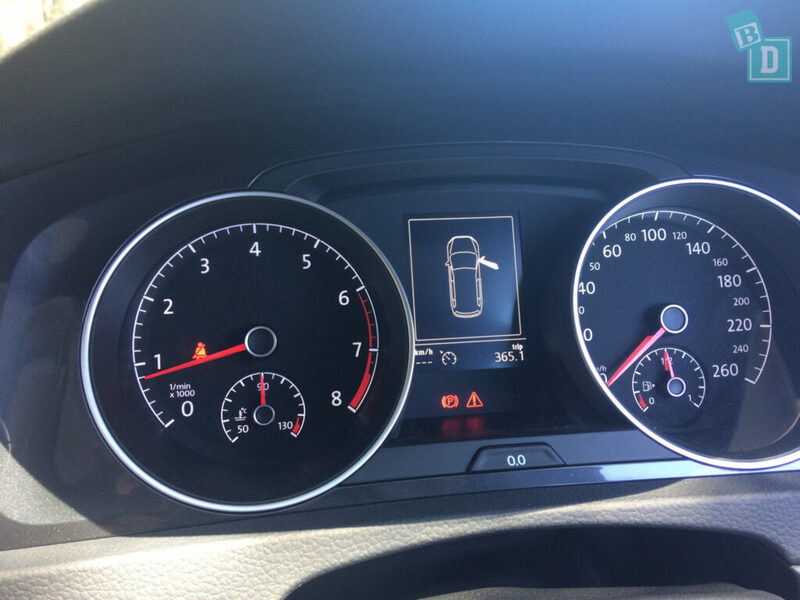 The Golf Wagon also has driver fatigue detection, which assesses your driving and if it detects changes in your driving consistent with driver fatigue it alerts you with an alarm to wake you up!